I am a Lecturer at the School of Engineering and Mathematical Sciences at City, University of London. I am part of the Department of Electrical Engineering within the school of School of Mathematics, Computer Science & Engineering. I have several opportunities for research students, check the section Positions and contact me if you are interested in Biomedical Image Analysis. I will chair the BMVA 1-Day Meeting: Computer Vision and Modelling in Cancer on the 11th October 2017. I will be a speaker at the 2017 Medical Image Understanding and Analysis Conference on the 11th July 2017. I am an academic editor of the journal PLOS ONE . I will talk in the Pint of Science Festival on the 17 of May 2017 in London. I served as a member of the Executive Committee of the British Association for Cancer Research between 2013 and 2016. I chaired MIUA 2014, which followed the excellent spirit and results of previous years. Please visit http://www.city.ac.uk/miua2014 for photographs, proceedings and other details of MIUA 2014. I wrote the book Biomedical Image Analysis Recipes in MATLAB: For Life Scientists and Engineers which was published in June 2015 by the editorial Wiley-Blackwell. My area of research is Image Analysis of Biomedical Images. This research covers three particular areas: the acquisition (I have worked with light and fluorescent microscopes as well as access to confocal and multiphoton microscopes) of biomedical images, the analysis through algorithms, mathematical models and statistical methodologies, which provide quantitative measurements, and the interpretation of the data (2D images, 3D volumes, 2D+t videos, 3D+t volumetric time lapse data sets). This final stage is crucial, what conclusions can we draw from the images? Can we reveal something of the underlying biological processes of cells or tumours? What are the effects of drugs or treatments? By using image analysis we are able to extract a wealth of information that is present in the images we capture, and that it is not possible to obtain by simple qualitative analysis. Measurement of cell migration in vitro. Measurement of fluorescence intensity for vessel and perfusion quantification. My undergraduate degree is from the National University in Mexico (UNAM, Facultad de Ingeniería) in 1993 with the degree of Ingeniero Mecánico Electricista, (BS Mechanical and Electrical Engineering). I then obtained an M.Sc. (MSc in Communications and Signal Processing) and D.I.C. from Imperial College of Science Technology and Medicine in 1994. From 1995 until 2000 I worked in Mexico for several years as a Lecturer at ITESM and ITAM teaching Communications and Electromagnetics related subjects. From 2001 until 2004 I returned to the United Kingdom to obtain a Ph.D. in Computer Science under the supervision of Dr. Abhir Bhalerao in the area of Medical Image Analysis with a thesis on Multiresolution Volumetric Texture Segmentation. At the same time, I worked as a Graduate Teaching Assistant at the Department of Computer Science, University of Warwick. From 2005 to 2011 I worked as a Research Associate and then Research Fellow at The University of Sheffield in the Tumour Microcirculation Group. In May 2011 I joined the University of Sussex as a Lecturer in Biomedical Engineering. I moved to City University London in July 2013. Conference Co-chair ANGIONET Angiogenesis Network, Sheffield University, January 2007 (with Markus Owen, University of Nottingham). 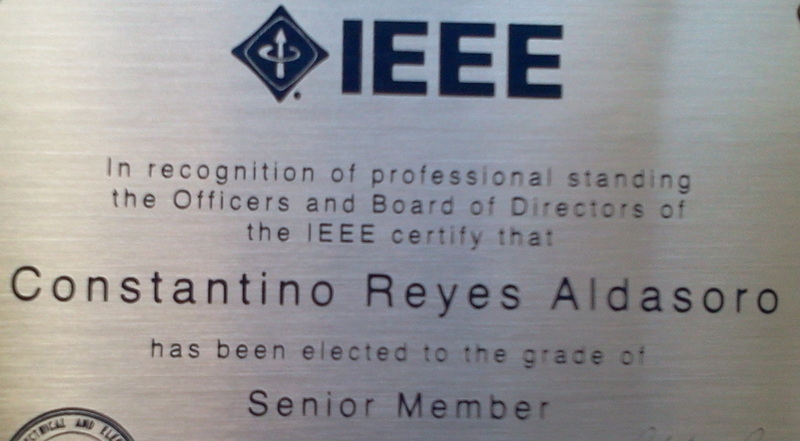 IEEE ISCC 2006, 2007, 2008. Science Ambassador National Science and Engineering Week 2007, 2009, 2010, 2011.